I once saw a documentary about X-rays and the way they travel invisibly through our bodies, which really creeped me out at the time – same as those subatomic particles barrelling through the helmets of astronauts and punching microscopic holes as they go. Well, I can now add a new category to all of these – Caithness wind, which I’ve discovered blows straight through my skull without being deterred by any headgear, exiting via the back, and leaving a chilled and shivering mass of shrunken brain behind. The wind, I find, is the defining characteristic of Caithness, along with the grey skies and dark winter nights. Walking in a strong wind is like crossing a field full of goats who keep wandering over and butting you from random directions, causing you to stagger drunkenly. People’s cheeks ripple and stretch as though they were in one of those g-force centrifuges the air force uses, and their clothes shimmer as though you’re looking at them underwater. Trees lean tiredly. 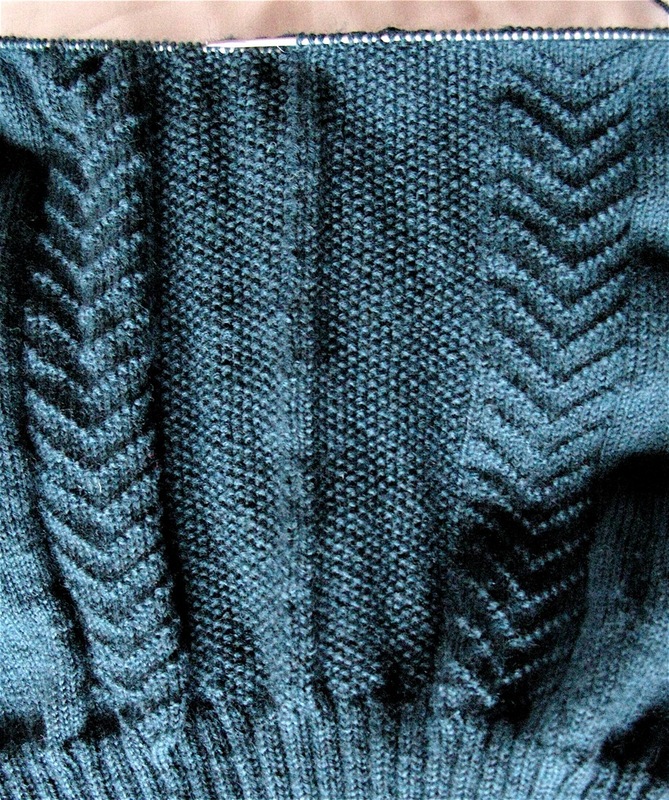 All of which reinforces the attraction of a gansey, though you’d also need several more layers and some thermal underwear if you were really venturing out. 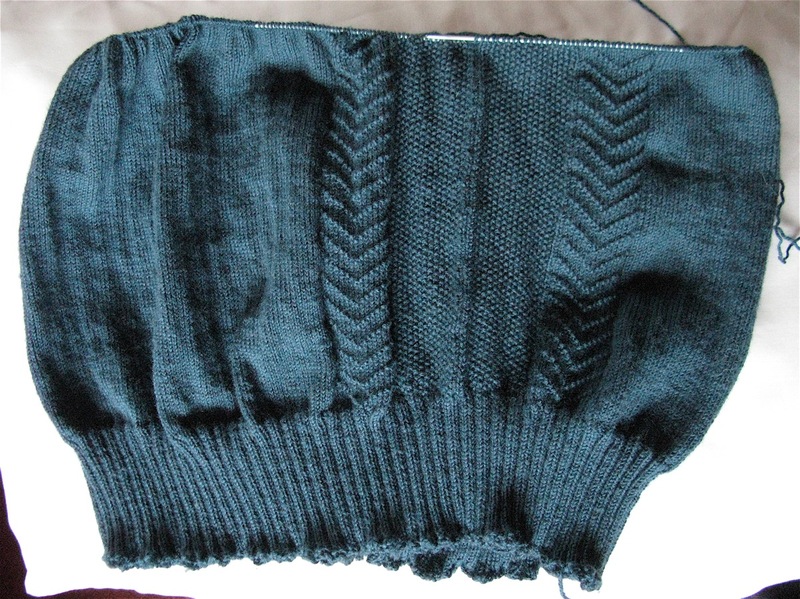 I’m inching my way nearer the start of the yoke, and the body is getting pretty floppy – I’ve got used to knitting ganseys that are patterned all over, so that the pattern effectively serves as reinforcing struts up the body, like the frame on an airship. Suddenly it feels like I have a drunken toddler on my lap, one with attention deficit disorder, or am trying to play a deflated set of bagpipes. 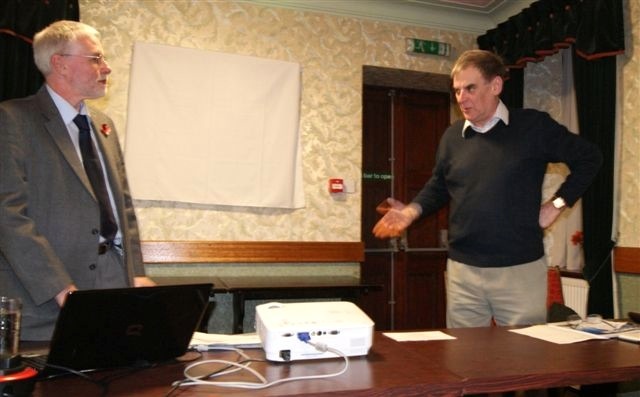 On Wednesday I gave a talk to the family history society. It seemed to go down well, though as I’m suffering with a nasty cold my voice gave out before the end and I finished up squeaking like Beaker from Sesame Street, and was reduced to getting my points across with hand gestures. As a thank-you they gave me a jar of golden local honey for my throat, which was very nice of them. There’s a possible joke to be made here about how Caithness honey should be cloudy and dark to reflect the weather, but that would be unfair – so long as it doesn’t give you wind…! Sarahy, you beat me to it – I was going to say this too. Gordon, this gansey’s lovely, and growing well. dunnet point any relation to lady dorothy? Love the travelog, the descriptions, oh, yeah, AND the gansey. Wow – you’re making it sound both very pretty and terrifyingly cold. I’m glad Margaret’s come up to spend some time there, though. Two people together will have an easier time staying warm! The gansey’s looking very nice as well! Cover your ears, Gordon! Don’t listen to Lynne blaspheming. Canadian rye or Irish whiskey?! Whatever is she thinking? 😉 The right way to do things is local honey, a local *Scotch* whiskey and if you’re needing something warming, then hot water and a pat of local fresh-from-the-farm grass-grazed butter. Preferably from a cow. Sheep’s butter is whiffy. My 1st year in the Netherlands I stood on a corner in Amsterdam absolutely amazed to see the wind & rain literally flying in 6 different directions. The nearby trees and people’s clothing were (apparently randomly) blown in 1 of the 4 cardinal directions. The person/tree nearby would be going another. The rain was also falling from above. Haven’t figured out how it’s possible to have rain fall straight AND from the left AND right. To top it off, the wind swept under the rain and flipping it back up so I was actually getting rained on from below. I’m not much of a whisky drinker, but the local distillery in Wick (Old Pulteney) has just won the Whisky of the Year award, so I may be tempted to give it a go. Oh, and Margaret tells me that Wick is on the same latitude as Juneau, Alaska, which gives you some idea of how we’re situated (it explains the climate, anyway!). Now, as for the Lord of the Rings and the Pentland Firth. as ever, your suggestions are better than the actual answer, but bear with me. Once upon a time there was a king, and he owned a magic mill that ground out first gold, then peace and prosperity, and the land enjoyed an unparalleled era of harmony. Two giantesses worked the mill, but the king refused to give them any time off (this was before the European Working Time Directive, you understand). So they rebelled, and got an army to come and invade the land. The king was killed, the land plundered, and everyone went back (with some relief) to a-fussin’ and a-feudin’, and the king and his era of peace was forgotten. 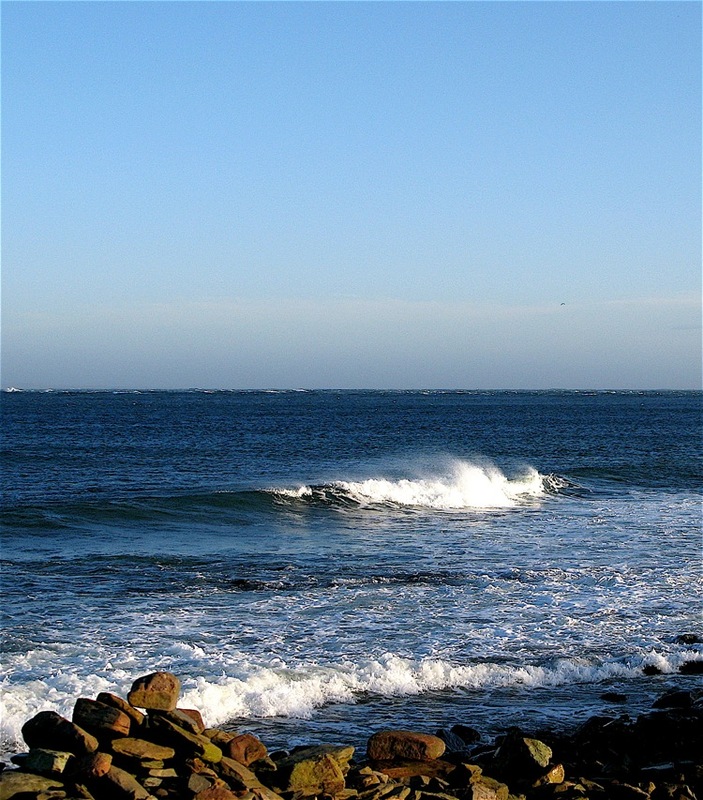 Now, one of the possible locations of the maelstrom that sucked down the ships is said to be the whirlpool just off the coast of Stroma in the Pentland Firth. And the name of the king who first owned the mill, and who ruled in peace and prosperity, was Froda. And, as Tolkien has said, masculine hobbit-names didn’t actually end in -o, they ended in -a (like the Anglo Saxons), so Bilbo was really Bilba, and Frodo was really … Froda. Now, Tolkien was very precise in his names, and knew these legends well. As Tom Shippey has pointed out, there are resemblances between Frodo and Froda. Both were pacifists, both tried to change the culture of their society, and both were misunderstood and forgotten as people reverted to their old ways. Of course, all this can be overstated (like I said, it’s a bit tenuous), but it’s likely Tolkien had all this in mind as he developed the character of Frodo in the book. I’m not aware of a direct connection between Lady Dorothy Dunnett and the parish of Dunnet. She was born Dorothy Halliday and married the splendidly named Alastair MacTavish Dunnett; but I’d imagine there must be a connection – maybe the family originally came from there? For more about that whirlpool story, read _Hamlet’s Mill_ by Santillana and Deschend. Don’t try to make it make sense, just let it wash over you. Wow, that’s pretty cool about Froda. Didn’t know the connection, but remembered reading about feminine/masculine hobbit names in the Appendices (yeah, I’m that nerdy that I read the Appendices). I’ve only been that far north once, but I know what you mean about the wind. Reminds me of that saying about a “lazy wind” – it goes right through you instead of going round. “Lazy wind” is a great description, though this wind feels a bit too purposeful to be lazy – more of a bully, really. And I hadn’t thought of Britain as a wind factory, processing the gales before sending them onto the Continent, but I guess that’s what all the wind farms are for! There’s a poem by DH Lawrence about artistic creativity, that begins “Not I, but the wind that blows through me…” – as true today as when it was written, I think, but not exactly in the way old DH meant it. Tamar, one of the problems I always had with the old Norse/Germanic legends was the way they never made sense! I read an amazing book about how Wagner extracted a meaningful narrative from the Niebelungenlied to form a libretto for his Ring cycle, and my admiration for the great man went up no end. Lynne – Atta girl! Crown Royal’s a good one – so’s Canadian Club.